Clean, quiet and an awesome location. 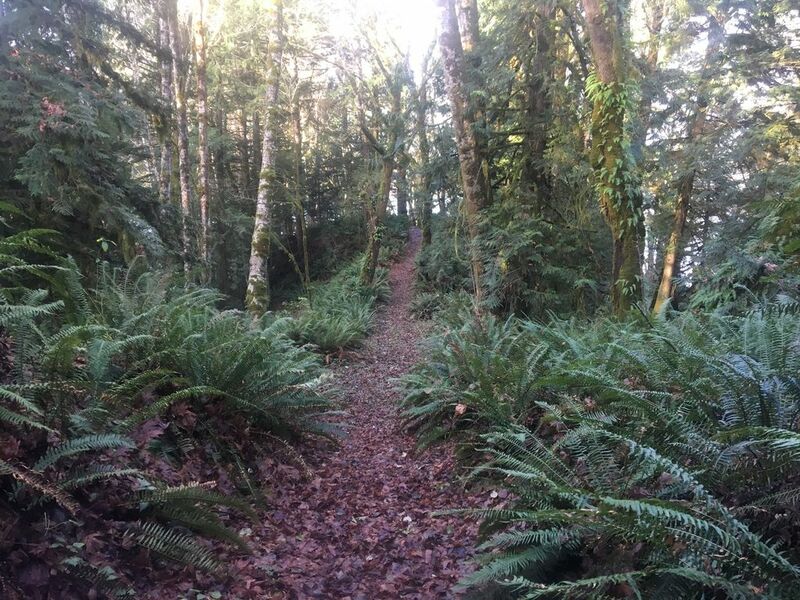 Trails to Puget Sound on our property! Private and Serene! It's hard to believe that we are only about an hour south of Seattle. This place is truly magical. From the very well maintained and equipped guest house to the private "park like" setting. We have over 7 acres directly on Totten Inlet at the south end of Puget Sound. Tall Trees, a walking trail and access to the beach highlight our property. Our one bedroom guest bungalow along has all the amenities of a 3 star hotel – very nice but not pretentious. We have our own private beach and our property will remind you of a park! The guest house is NOT on the water. It is set back about 1/4 mile on our property. You do have access to the beach and the property. We have Comcast and Tivo. All you have to do is turn the power on with the television remote and everything else is controlled by the Tivo remote control. You can stream Netflix, Hulu, Amazon Video etc. through Tivo. If you use any Pay Per View options, you will be charged for what you watch. While staying here, guests will have full access to the trails and to the beach access trail on our property. There is a beautiful trail to the beach along the north side of our property. All you do is follow it to where the trail goes to the Y and stay right. There are oysters on our beach. Please don’t take more than your fair share. And remember the R in the month rule – Only eat oysters in months with an R in them. Even though these are “our oysters” you still need a shellfish permit to gather them. Please be careful, the trail is slippery and steep. You are on your own if you decide to go to the beach. We are in a commercial shellfish area. Do not trespass on other people's property. Our driveway leads right to the front door making packing and unpacking easy. Feel free to park your car in front of the garage. If you have more than one vehicle, please park the additional vehicle out in the driveway. We live on the property. This guest house is close to our personal residence. We only offer it to people who we feel will respect the land and our personal stuff. We have two dogs and a cat. They live here too. If you have problems with allergies or any phobia with animals – this may not be the place for you. We occasionally have horses on our property too. Don’t ask to ride them, they aren’t ours. We see wildlife all the time on the property. It is common to see deer, racoon, opossum, squirrels, chipmunks, owls, otters, bald eagle and other more common animals. We are about half way between Olympia and Shelton. The area is called Oyster Bay. This is a commercial oyster production area. We have oysters on our beach. You are welcome to sample a few! The bungalow is also just a few miles from The Evergreen State College where guests can walk around on its network of trails that navigate 100 acres of woods and leads to the Evergreen Beach. A beautiful walk for those seeking more of what the area has to offer. From here it is just another mile or so into downtown where you can get world-class coffee, tasty food, or a veritable cornucopia of items from the many shops and stores. 20 minutes south offers great views in Capitol State Forest or contemplate the mysterious presence of the Mima Mounds at Mima Mounds Natural Area Preserve. And the coast is just an hour away through Aberdeen with peninsula access via Highway 101. You are going to need a car to get here. There is no public transportation. It is secluded yet close in. A well stocked local grocery store, tavern, gas station and a few other local businesses are within 3 miles. We will respect your privacy or you can become “one of the family” and invite the pets into the guest house. We ask that you respect the environment and respect the property. Don't break or damage anything and take care of yourself. If you have any questions just call anytime day or night. And most important, enjoy your stay! We are business owners in the Puget Sound area. My wife and I have two kids, two dogs and three cats. We travel 3-4 times per year and like to go some place warm at least once a year. We do a lot of our business through e-mail and "the cloud" so Internet access is a MUST HAVE for us. Which is why we understand what's important for travelers too! We like culture, music and off-beat things. Especially if it involves good food! We fell in love with this place when we bought it over 15 years ago. We live on over 7 acres of land on Totten inlet at the southern end of Puget Sound. It is a pretty amazing place, almost like a park when you walk through the tall trees down to the bay. This home was the original homestead on over 160 acres of land. It has seen uses as an oyster farm, chicken ranch, commune, and now it's our home. You wouldn't know about any of the prior history unless we showed you though! We still operate a very small oyster growing operation here! Close to Olympia, The Evergreen State College and the Olympic Mountains, Hood Canal, Lake Cushman and the Olympic Peninsula. Bathroom has a full size tub/shower. Our property fronts Totten Inlet on the southern end of Puget Sound. The cottage is not on the water. You can easily walk on the trail to the beach. We have seen otters, eagles, & other wildlife. Sorry, No Pets are allowed. We do not let out pets in the guest house in order to respect those who may have an allergy. Nice, clean, comfortable cottage, in a quiet setting. My husband and I stayed here for 2 1/2 weeks while in transition after our home sold, and it had everything we needed! It was much more convenient than staying in a hotel, having a living room, a kitchen with a full-size refrigerator and a washer and dryer, and it was in a much better setting! Very clean and comfortable. Many extras included like coffee tea and water. Full kitchen. Entertainment center. Very isolated location, close to forest and bay. The house was very well kept and maintained. It was clean, quiet and just what we were looking for! The only thing that I would recommend is that they notify folks that they ONLY have a Keurig coffee maker. There was not another type available.